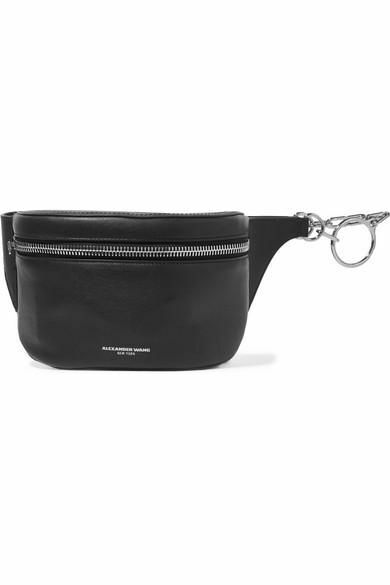 Belt bags, also known as fanny packs, are back. Yes, you read that correctly. The hands-free accessory of the '80s has resurfaced on the waists of some of our favorite street style stars, but with modern, stylish updates. Rendered in leather, decorated with studs, and available in a slew of elegant, modern shapes, today's fanny pack is becoming much more than an athleisure staple. It's now a cool, convenient, comfortable way to tote around your day-to-day essentials. Not sure about the hands-free bags just yet? Below, we've rounded up 10 super-stylish fanny packs that you'll want to wear everywhere. From a fun, sporty-chic Kate Spade version that harks back to its origins to a minimalistic, modern iteration that doubles as a wallet, these waist-hugging bags certainly deserve a spot in your closet (and on your waist). You can never go wrong with Wang. How cute is this sleek little wallet bag? Wear this one around your waist or on your shoulder—your choice. The perfect way to add a pop of red to your outfit. We love the unique shape of this particular fanny pack. Pair this crisp white fanny with an all-gray outfit. This fanny pack is a work of art. We love how Rosie Huntington-Whiteley used this bag to make her suit feel fresh and new. Here's how to incorporate velvet into your summertime outfits. Want more '80s-inspired pieces? Read on to revisit (and shop) one of the most polarizing trends of the decade.